Download "The Special Education Technology Center of Washington State"
6 6 Categories of Assistive Technology Products AAC (Augmentative and Alternative Communication) Adaptive switches Environmental control Alternate computer input Specially designed computer software for adapted activities in reading, writing, math, etc. 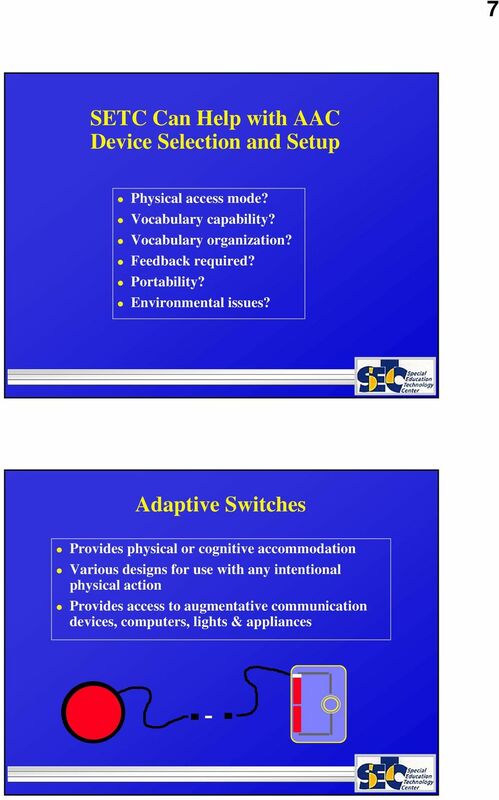 SETC does not design adaptations or lend devices for mobility, positioning, vision or hearing. 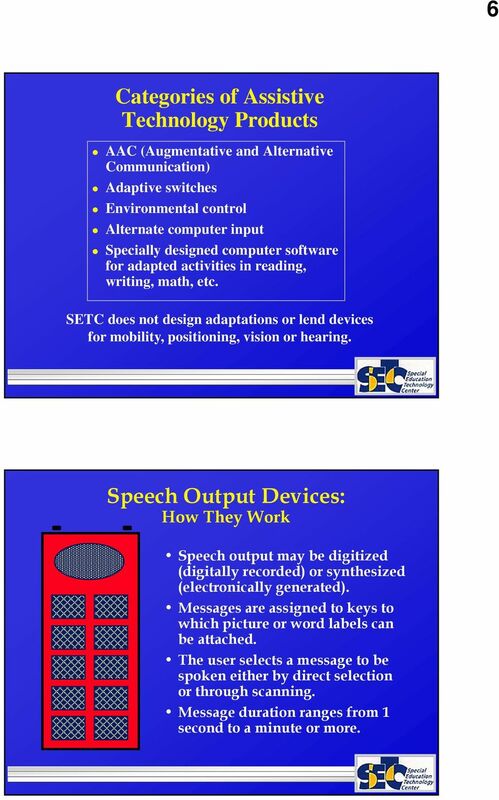 Speech Output Devices: How They Work Speech output may be digitized (digitally recorded) or synthesized (electronically generated). Messages are assigned to keys to which picture or word labels can be attached. The user selects a message to be spoken either by direct selection or through scanning. Message duration ranges from 1 second to a minute or more. 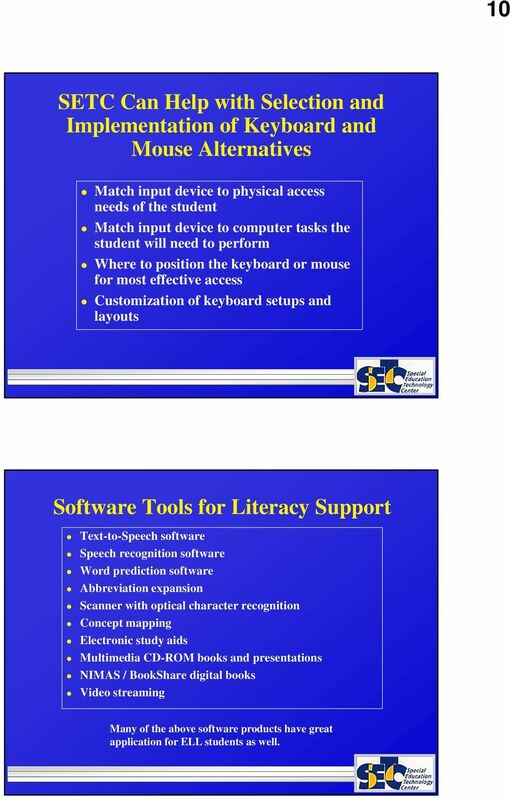 10 10 SETC Can Help with Selection and Implementation of Keyboard and Mouse Alternatives Match input device to physical access needs of the student Match input device to computer tasks the student will need to perform Where to position the keyboard or mouse for most effective access Customization of keyboard setups and layouts Software Tools for Literacy Support Text-to-Speech software Speech recognition software Word prediction software Abbreviation expansion Scanner with optical character recognition Concept mapping Electronic study aids Multimedia CD-ROM books and presentations NIMAS / BookShare digital books Video streaming Many of the above software products have great application for ELL students as well. 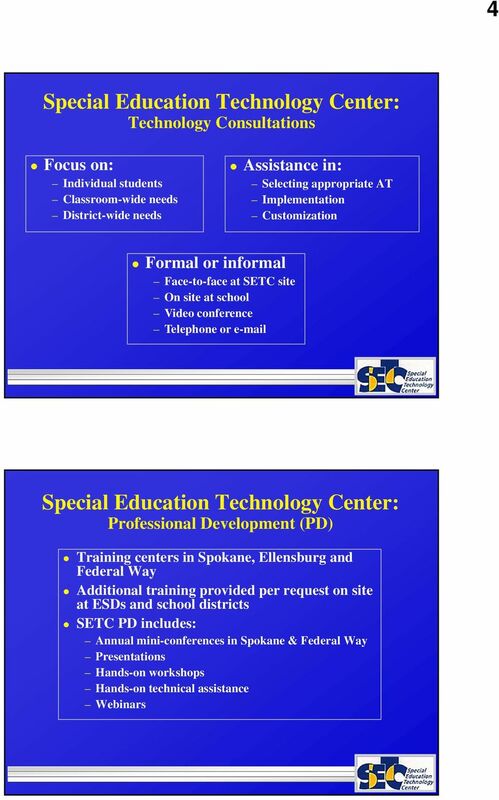 SPECIAL EDUCATION STAFF People in several roles support the delivery of Services in TLDSB. 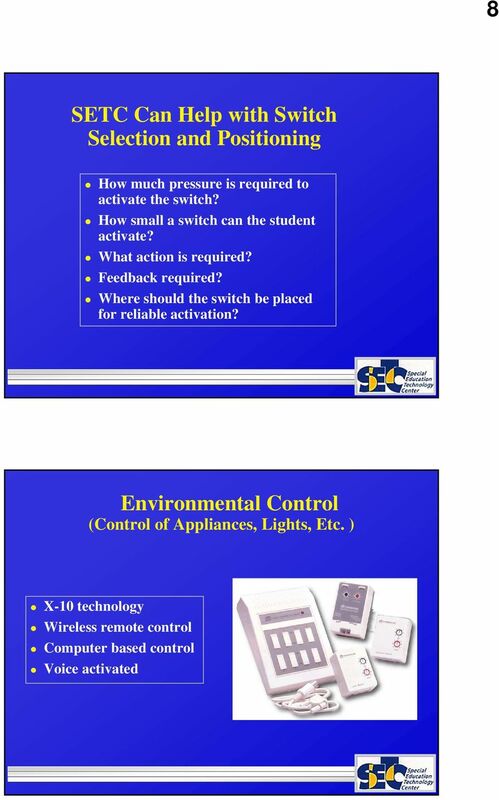 These roles are filled by employees of the board, and by persons contracted to provide service in some areas. 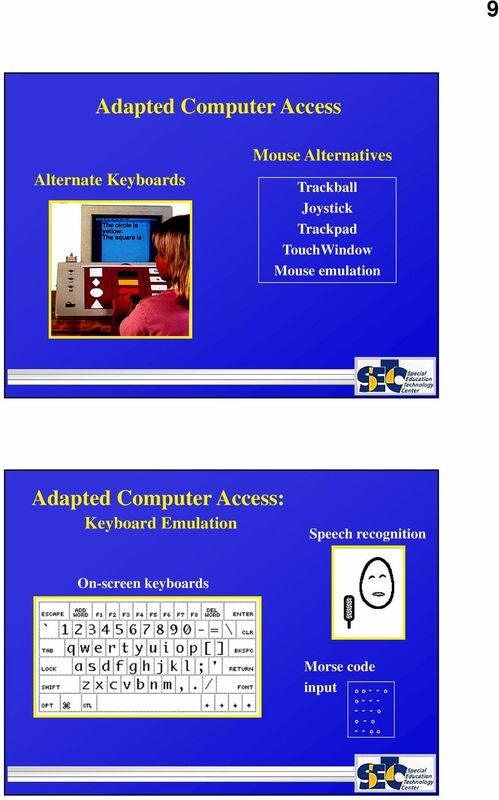 DATI Assistive Technology Facts Augmentative and Alternative Communication I may not like what you have to say, but I ll defend to the death your right to say it. 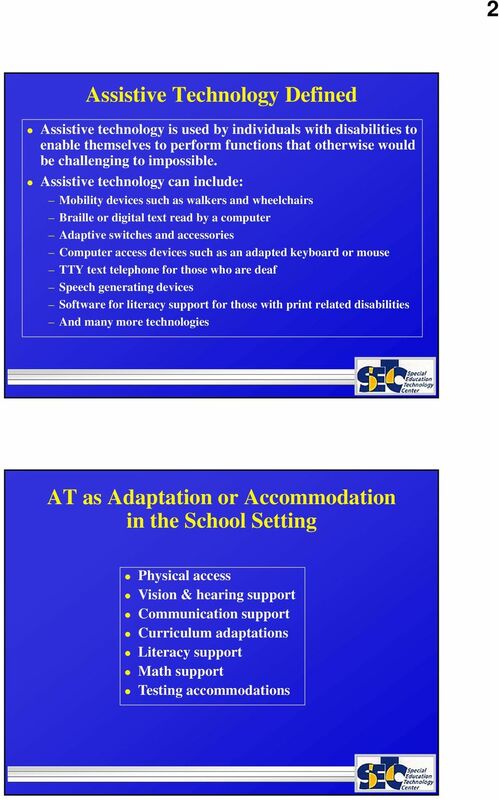 - Voltaire What is assistive technology? 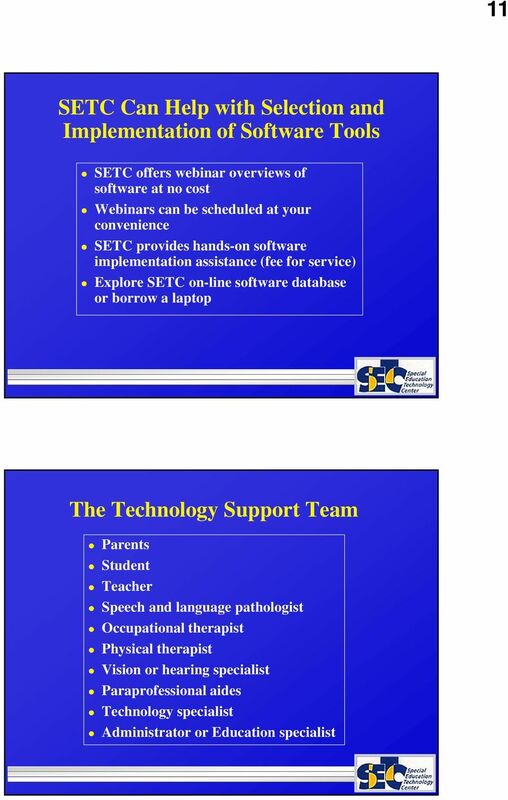 Learning Technology and Diverse Students: A Classroom Resource Guide for School Teachers Fangfang Wen Introduction Learning technology could be a useful tool to help teachers meet diverse students needs. The Keyboard One of the first peripherals to be used with a computer and is still the primary input device for text and numbers. 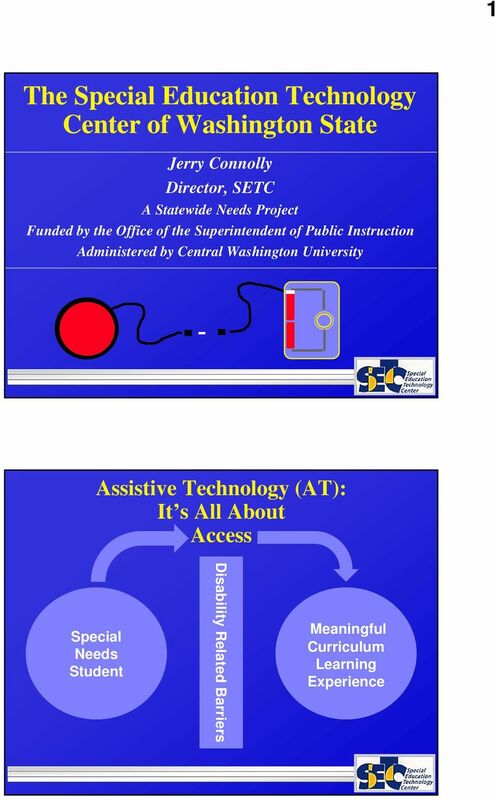 Why is Technology Access for Students With Disabilities Important? Independent Speech School-Based Services Information Packet 1-877-480-7913 www.independentspeech.com info@independentspeech.com Hello, My name is Stephanie Barry, I am the founder of Independent Speech. 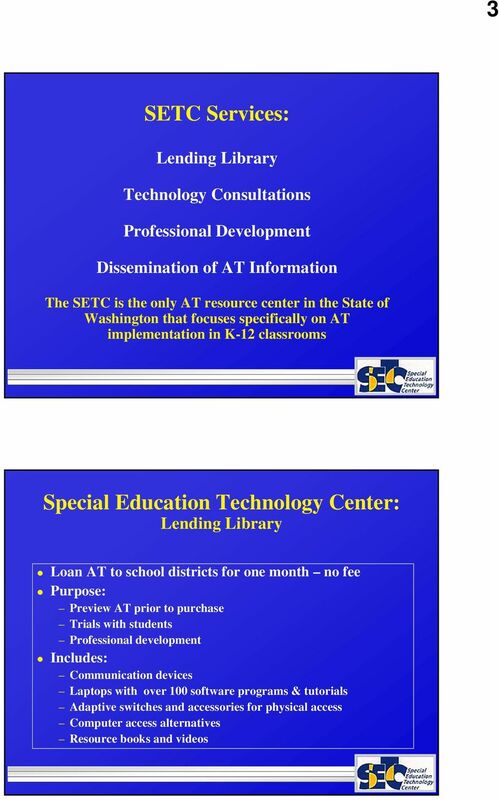 professional development Training Guide u Webinar and training Information u Guided Tour u How To Tips Welcome! Your school now has unlimited access to the award-winning Britannica Online School Edition. A communication device that records any series of messages. Two minutes of recording time.